Background: Guidelines warn of increased risks of injury when placing regional nerve blocks in the anesthetized adult but complications occurred in patients that received neither sedation nor local anesthetic. This restriction of nerve block administration places vulnerable categories of patients at risk of severe opioid induced side effects. Patient and operative technical factors can preclude use of preoperative regional anesthesia. The purpose of this study was to assess complications following sciatic popliteal and femoral or saphenous nerve blockade administered to anesthetized adult patients following foot and ankle surgery. Materials and Methods: Postoperative patients administered general anesthesia received popliteal sciatic nerve blockade and either femoral or saphenous nerve blockade if operative procedures included medial incisions. Nerve blocks were placed with nerve stimulator or ultrasound guidance. A continuous nerve catheter was inserted if hospital admission was over 24 hours. Opioid analgesic supplementation was administered for inadequate pain relief. Postoperative pain scores and total analgesic requirements for 24 hours were recorded. Nerve block related complications were monitored for during the hospital admission and at follow up surgical clinic evaluation. Results: 190 anesthetized adult patients were administered 357 nerve blocks. No major nerve injury or deficit was reported. One patient had numbness in the toes not ascribed to a specific nerve of the lower extremity. Perioperative opioid dose differences were noted between male and female and between opioid naïve and tolerant patients. Background: Placement of a cuffed endotracheal tube for the administration of general anesthesia is routine. The cuff of the endotracheal tube is inflated with air to achieve an adequate seal to prevent micro-aspiration. Over inflation of the cuff can decrease the mucosal perfusion, leading to pressure necrosis and nerve palsies. Inadequate seal can lead to micro aspiration. So the cuff pressure has to be monitored and kept within the prescribed limits of 20-30 cms of water. Aim of the Study: To observe the effect of different positions on the endotracheal cuff pressure in patients undergoing neurosurgical procedures. Materials and Methods: This is an observational study conducted on 70 patients undergoing neurosurgical procedures in various positions. After intubation, the cuff pressure was checked with a cuff pressure manometer, Endotest (Teleflex Medical, Rush) and adjusted to be within the allowable pressure limits as is the routine practice. The cuff pressure was checked again at three time points after achieving the final position with the head on pins, at the end of the procedure and before extubation. Various factors such as the age, position, duration of surgery were studied. There were no major complications like aspiration, stridor or hoarseness of voice post extubation in any of the patients. Results: A significant decline in the cuff pressures were noted from the initial supine position to extubation (P < .001) in the supine group. Also a significant decline in the cuff pressures were found in the prone group from their initial intubated supine position to all the other three corresponding time points namely after final positioning (P < .001), at the end of the procedure (P < .001) and before extubation (P < .001). Conclusion: Cuff pressure has to be checked after achieving the final positioning of the patient and adjusted to the prescribed limits to prevent micro aspiration. Aim: Children are prone to burn injury. Burns can be seen as a part of child abuse. The aim of this study was to investigate the factors affecting adherence to the treatment of burn patients, and to emphasize the role of the physician in identifying children's non-accidental burn injuries. Materials and Methods: Children who were hospitalized in the burn unit were analyzed retrospectively. Results were assessed for significance using the Chi-square test. Results: A total of 189 patients were included. Some patients (n = 52; 27.5%) were discharged against medical advice (DAMA) before completion of treatment. Although we could not demonstrate a relationship between non-accidental etiology and DAMA group, it was significant that these patients did not contact the outpatient clinic after discharge. It was evident from records that two of these cases were abused. The reasoning of the parents in the DAMA group for the early discharge was siblings at home, financial and accommodation problems. 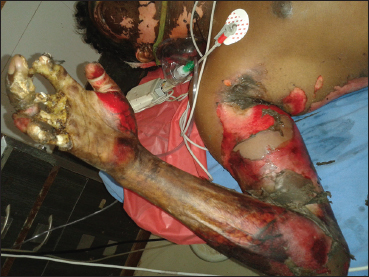 Conclusion: Although burns in children commonly occur due to an accident, each burn case should be examined for a non-accidental etiology and findings suggesting abuse should be noted. Physicians should be alert for the detection of signs of burn related child abuse. The concept of pediatric emergency medicine (PEM) is virtually nonexistent in India. Suboptimally, organized prehospital services substantially hinder the evaluation, management, and subsequent transport of the acutely ill and/or injured child to an appropriate facility. Furthermore, the management of the ill child at the hospital level is often provided by overburdened providers who, by virtue of their training, lack experience in the skills required to effectively manage pediatric emergencies. Finally, the care of the traumatized child often requires the involvement of providers trained in different specialities, which further impedes timely access to appropriate care. The recent recognition of Doctor of Medicine (MD) in Emergency Medicine (EM) as an approved discipline of study as per the Indian Medical Council Act provides an unprecedented opportunity to introduce PEM as a formal academic program in India. PEM has to be developed as a 3-year superspeciality course (in PEM) after completion of MD/Diplomate of National Board (DNB) Pediatrics or MD/DNB in EM. The National Board of Examinations (NBE) that accredits and administers postgraduate and postdoctoral programs in India also needs to develop an academic program – DNB in PEM. The goals of such a program would be to impart theoretical knowledge, training in the appropriate skills and procedures, development of communication and counseling techniques, and research. 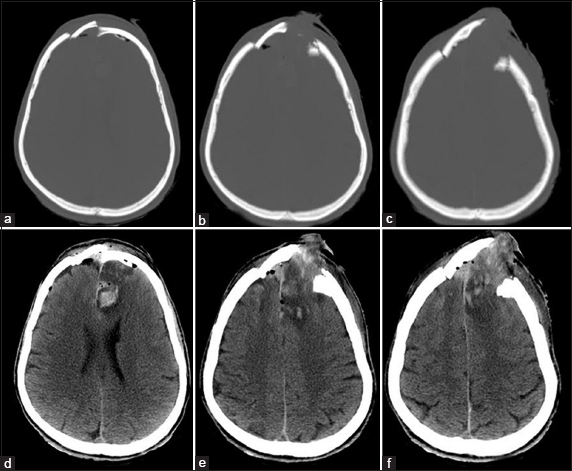 In this paper, the Joint Working Group of the Academic College of Emergency Experts in India (JWG-ACEE-India) gives its recommendations for starting 3-year DM/DNB in PEM, including the curriculum, infrastructure, staffing, and training in India. This is an attempt to provide an uniform framework and a set of guiding principles to start PEM as a structured superspeciality to enhance emergency care for Indian children. 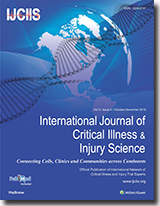 Intrahospital transportation of critically ill patients is associated with significant complications. In order to reduce overall risk to the patient, such transports should well organized, efficient, and accompanied by the proper monitoring, equipment, and personnel. Protocols and guidelines for patient transfers should be utilized universally across all healthcare facilities. Care delivered during transport and at the site of diagnostic testing or procedure should be equivalent to the level of care provided in the originating environment. 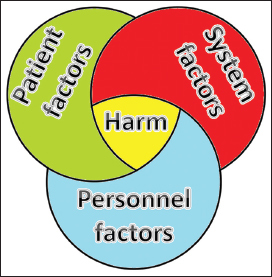 Here we review the most common problems encountered during transport in the hospital setting, including various associated adverse outcomes. Our objective is to make medical practitioners, nurses, and ancillary health care personnel more aware of the potential for various complications that may occur during patient movement from the intensive care unit to other locations within a healthcare facility, focusing on risk reduction and preventive strategies.